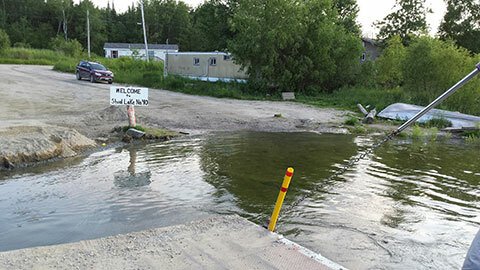 Photo: Arriving at the Shoal Lake #40 reserve by ferry. The lake provides all the drinking water for the city of Winnipeg but the people of Shoal Lake #40 have long been under a boil water advisory because the federal government has failed to replace the community's inadequate water treatment system. Indigenous communities across Canada simply cannot take the safety of their drinking water for granted. Many today do not have access to safe, clean drinking water in their homes or proper sanitation systems, while the rivers and streams on which they have long relied while out on the land are increasingly contaminated by industrial activity. As of January, 2018, the federal government was reporting that 91 First Nations were under long term drinking water advisories. This number does not include First Nations in British Columbia, where First Nations water systems fall under a different regulatory authority. Nor does it include First Nations without any drinking water system at all, or those that rely on systems such as household storage cisterns that are not subject to such advisories. The new investments being made by the federal government have already resulted in improvements in water quality in some communities. But the measures to date are not sufficient. An important study by the David Suzuki Foundation -- Glass Half Empty? Year 1 Progress Toward Resolving Drinking Water Advisories in Nine First Nations in Ontario -- provides a clear analysis of why the bureaucratic process of a federally-controlled First Nations water and sanitation regime actually stands in the why of a timely solution to this longstanding crisis. The report also noted that measures to replace or repair drinking water infrastructure does not address the ongoing problem of industrial contamination of the source water on which Indigenous peoples rely. The report was updated earlier this year: Reconciling Promises and Reality: Clean Drinking Water for First Nations. Work with First Nations to streamline and simplify the process for capital investments in water infrastructure by identifying roadblocks and reducing bureaucracy. Collaborate with First Nations in co-developing and implementing source water protection and restoration plans.